talking about Walt Disney World or WDW, is no exception. 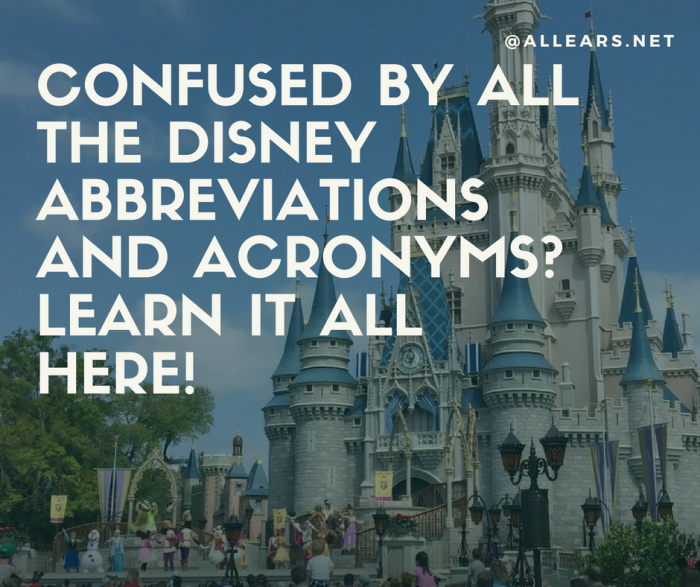 The following is a list of the abbreviations and acronyms used by cast members and folks on the internet to describe Walt Disney World attractions, resorts, restaurants and more — both past and present. Note that some abbreviations have multiple meanings and some destinations have multiple abbreviations. Emoticons – Emoticons: Punctuation signs that are arranged within text in such a way as to display the simulation of a face when viewed by turning your head to one side. Inserted into text to relay a facial expression or emotion/attitude to match the text, softens the text to “humanize” it somewhat and make it seem less harsh, less blunt, offered as friendly advice, etc., or to relay how news/information affects the writer. Mickey and Minnie Mouse, respectively, the leaders of the Club that’s made for you and me!